It’s the holiday season! With that comes the cocktail hours, cookie-baking, end-of-year celebrations and countless other festivities that include delicious food. Unfortunately, along with that delicious food and festivities, come many extra calories. The bad news: any weight you gain over the holidays tends to stay with you. A study funded by the National Institutes of Health found participants gained about one pound between Thanksgiving and New Year’s Day, but then kept that pound on for the rest of the year. (The study included 195 subjects, who were evaluated for weight and health measures every six weeks before, during and after the winter holiday season.) 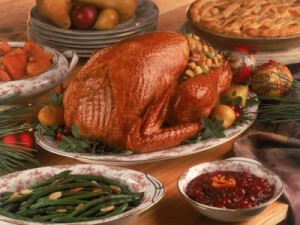 While it’s only one study, the evidence suggests that holiday weight gain can be cumulative. Over a life time, that could mean putting on 40 or 50 pounds. So, what’s a cookie-lover to do? There are some evidence-based tips on avoiding weight gain over the holidays. Exercise a lot. Systematic reviews show that burning the calories you consume is an effective strategy for preventing weight gain. That may mean more exercise than you think. One reviewfound that in order to maintain weight, participants need to burn 1,500 to 2,000 calories per week exercising. That’s the equivalent of walking about an hour a day at a moderate pace or running 13 miles a week. Keep track of your diet, exercise and weight. The evidence showsthat weighing yourself on a regular basis and keeping a journal to track diet and exercise really works. Fill up on fruits and vegetables. The evidence clearly shows people who eat more fruits and vegetables are less likely to become obese. At a buffet, fill at least half of your plate with fruits and vegetables. And at home, focus on eating meals with larger quantities of fruits and vegetables. The take-home message: Even though the holidays are a time to indulge, if you’re aware of your diet and exercise and if you make an effort to take good care of yourself, you can avoid – at least in part – gaining too much weight. Eating at home means you should always have something in your fridge, and it’s not enough just to know 2-3 recipes, I advice gathering with friends and cooking together!